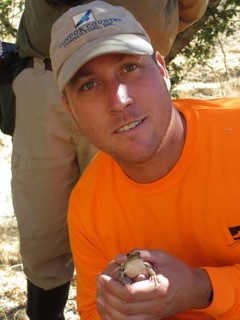 Christian Knowlton has three years experience as a biologist, including work with California wildlife and plant species. He has experience in a wide variety of fieldwork, including passerine and raptor surveys, nest surveys, camera trapping, herpetological surveys, small mammal trapping, and construction monitoring. At CCCI, Mr. Knowlton has surveyed for and monitored nesting birds, special-status bird species (western burrowing owl, golden eagle, Swainson’s hawk), special status amphibians (California red-legged frog (CRLF), California tiger salamander (CTS)) and reptiles (giant garter snake), and has conducted both botanical surveys and wetland delineations. Mr. Knowlton has surveying and handling experience with CRLF and CTS using dip nets, seines, and pitfall traps. He also helps with data management, reporting, and map generation (using ArcGIS) on CCCI projects. Before coming to CCCI, Mr Knowlton conducted raptor surveys and monitoring to inform timber harvest and conservation efforts. The work included day and night surveys for California spotted owl, northern goshawk, and great gray owl. Mr. Knowlton conducted USFWS-protocol surveys and monitoring for California spotted owl, and assisted California spotted owl banding for California spotted owl research in Lassen National Forest. When he was a field botany teaching assistant, Mr. Knowlton helped students identify over 800 California plant species, from the Central Coast of California to the Mojave desert.